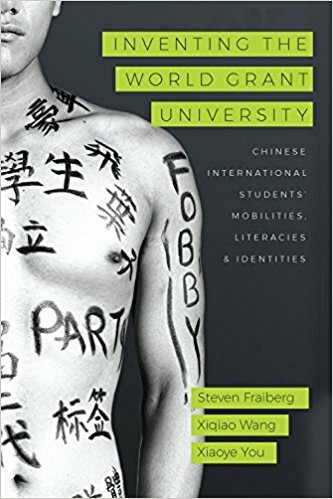 Through an exploration of the literacy practices of undergraduate Chinese international students in the United States and China, Inventing the World Grant University demonstrates the ways in which literacies, mobilities, and transnational identities are constructed and enacted across institutional and geographic borders. Steven Fraiberg, Xiqiao Wang, and Xiaoye You develop a mobile literacies framework for studying undergraduate Chinese international students enrolling at Western institutions, whose numbers have increased in recent years. Focusing on the literacy practices of these students at Michigan State University and at Sinoway International Education Summer School in China, Fraiberg, Wang, and You draw on a range of mobile methods to map the travel of languages, identities, ideologies, pedagogies, literacies, and underground economies across continents. Case studies of administrators’, teachers’, and students’ everyday literacy practices provide insight into the material and social structures shaping and shaped by a globalizing educational landscape. Advocating an expansion of focus from translingualism to transliteracy and from single-site analyses to multi-site approaches, this volume situates local classroom practices in the context of the world grant university. Inventing the World Grant University contributes to scholarship in mobility, literacy, spatial theory, transnationalism, and disciplinary enculturation. It further offers insight into the opportunities and challenges of enacting culturally relevant pedagogies.